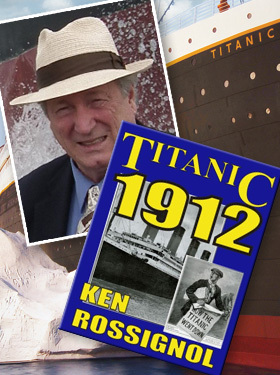 For those who wonder what really happened when the Titanic sank, Ken Rossignol, author of “Titanic 1912,” will provide details at the Hotel Fauchere’s “Titanic Dinner” Sunday, at which food from the galley’s recipes will be served. The evening of immersion in the facts, fiction, follies and foods of the Titanic is a collaboration between the Pike County Historical Society and the Fauchere. 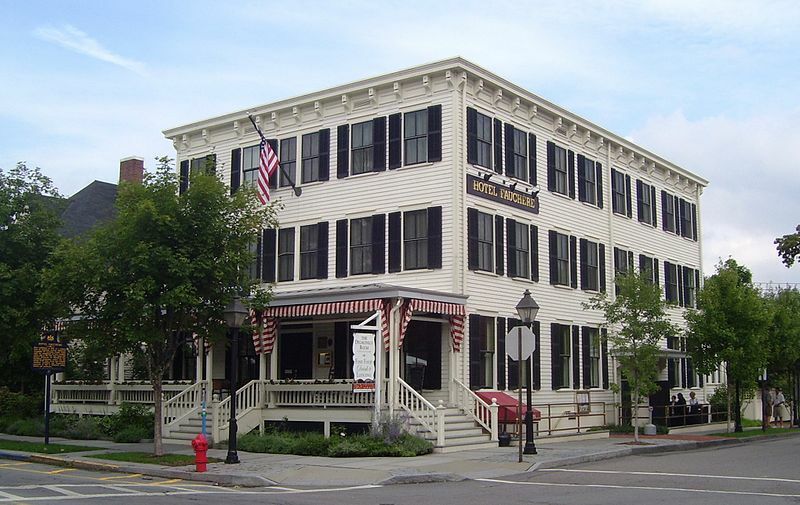 It will begin at 5:30 p.m. with Rossignol’s presentation at the Emerson House, next to the hotel. The dinner afterward will be in the Delmonico Room of the Fauchere. Rossignol will expound on who was brave, who was cowardly, who later lied, told the truth, or was befogged. He can explain what made Molly Brown unsinkable and why the ship’s crew lacked binoculars to see the iceberg ahead. Rossignol, who writes cruise ship thrillers and lectures on cruise ships, may also offer advice on what to do should you find yourself on a sinking ship. One piece of advice he gives is to bring a flashlight. As a ship sinks, electricity is lost and the ship goes dark. 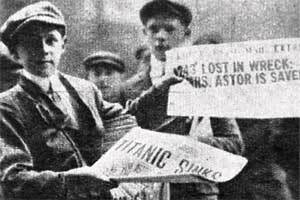 Rossignol started his own weekly newspaper in Maryland, Saint Mary’s Today, when he felt local newspapers were filling pages with fluff while missing important stories, and he did extensive research to find out how 1912 newspapers made big mistakes with the Titanic story. Despite fast-moving information that quickly provided photos of the disaster, the London Daily Mail wrote that “all were saved,” and the Washington Post wrote that 800 had died, though the dead numbered over 1,500. Rossignol will also highlight what news reports completely missed. He says, for instance, that while the ship was approaching an iceberg, 12 crew members were working around the clock to put out a coal fire that was damaging the ship. He points out that, like the Titanic, the World Trade Center was also undermined by heat-damaged metal. Rossignol, who has seen the 1997 film “Titanic” 15 times, says he knows all about all five Titanic movies. He has written poems about the disaster and is familiar with many poems written by the public about it. What: Titanic lecture, dinner will follow in the Delmonico Room of Hotel Fauchere. Where: Emerson House, 401 Broad St., Milford. MILFORD — Ken Rossignol is a writer who has led a very interesting life. From reporting hard news, getting confessions from criminals, and speaking out on an unfair court system; to writing murder-mystery novels and poetry, Ken has ran the gamut of topics and genres. 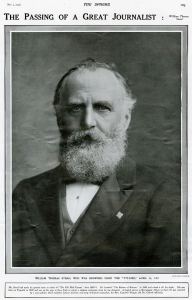 Rossignol has also written three books in which he explores different subject matters regarding the RMS Titanic, the famed luxury liner which met its demise due to an iceberg back in 1912. We’ve all seen the movie. We’ve all heard the Celine Dion song, ad nauseum, but did you know the New York Times received hundreds of poems about the sinking of the Titanic daily in the days following the sinking or that there were 3,500 pounds of tomatoes aboard and 75,000 pounds of fresh meat? In the book “Titanic 1912” Rossignol examines the facts and non facts which were printed about the great ship, its passengers, crew, and all things titanic, about the Titanic, which appeared as news in papers around the globe. Sometimes guilty of just reading the headlines, Ken found that if you read the whole story, many were contrary in fact and even dead wrong, in some cases. Ken will share his insights and musings regarding the HMS Titanic and its fateful trip on April 27 in connection with a very special “Titanic Dinner” hosted by the Hotel Fauchere in cooperation with the Columns Museum. A presentation by Rossignol will be held at the Emerson House, located next to the Hotel Fauchere, beginning at 5:30 p.m., followed by a dinner in the Hotel’s Delmonico Room which will consist of courses prepared on the Titanic, with Hotel Chef’s using original recipes from the ship’s various dining salons and it’s a la carte offerings in the ships “The Ritz” restaurant. The cost for the dinner and lecture is $75, tax and gratuity included, with $10 of each sale being donated to the Pike County Historical Society. The lecture begins at 5:30 p.m. in the Emerson House. Dinner will then follow in the Delmonico Room of the Hotel.